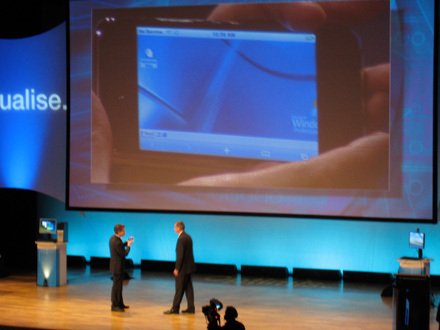 In the Citrix Application Delivery Conference in Melbourne, during the keynote titled Directions in Virtualisation & Application Delivery in the Dynamic Datacentre, XenDesktop was used simulate XP running on an iPhone. XenDesktop is “a next-generation desktop virtualization solution designed for a full desktop delivery experience in a VDI environment.” Basically it is a Unix application that allows Windows Sessions to be accessed over WiFi via a Citrix server. So, the iPhone isn’t actually running windows XP it just looks like it is. Here are some photos from the conference.